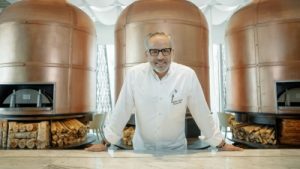 Four Seasons Hotel Kuwait at Burj Alshaya Executive Chef Sebastiano Spriveri is happy to extend an invitation to all gourmands for his special Sebastiano and Friends event. The upcoming Sebastiano and Friends event promises diners an interactive Sicilian feast and an unforgettable experience at Dai Forni restaurant: talented Chef Giuseppe Pappalardo has crafted a special menu that celebrates Sicilian culinary heritage, and a demonstration of mozzarella making with Chef Enrico Carretta and cheese monger Chef Biagio Floro in a live show of skills for everyone to enjoy. “Sebastiano and Friends is the culinary event of the season that you mustn’t miss! This promotion is an introduction of the culinary heritage of Italy to Kuwait where the cheese-monger and Chefs will be working side by side to craft delicacies that will satisfy all of our guests. You will watch as Biagio and Enrico work alongside myself and our Chef de Cuisine Daniele Bartolo to bring Italy here,” says Chef Spriveri. “I’ve always had a passion for mozzarella. After graduating, I worked as a consultant in an audit firm, but every time my dad asked me what I wanted to do in life, my answer was always the same: mozzarella. Now we are here in Kuwait to present our master craft to the local community and create delightful dishes where each one follows an original and authentic Italian recipe,” adds Enrico Carretta.